Is this like a bad old movie or what? Jimmie Johnson is a great guy, a classy guy, well spoken, mild-mannered, polite. Just a good guy. Except he's winning too darned much. At the moment the four-time Sprint Cup champion is on target to win at least 21 races this season. He's three-for-five out of the gate, and he's favored here in Sunday's Goody's 500 – in his last 15 starts at Clay Campbell's flat half-mile he's finished no worse than ninth, and he's logged six wins, a pair of seconds, and a pair of thirds. Yes, he's been lucky this spring. But he's been quick to capitalize on those openings. And he rarely makes mistakes. To beat Jimmie Johnson and crew chief Chad Knaus, you have to bring your A-game. Surprisingly, and worrisome, to hear it in rivals' haulers, is that Johnson and Knaus are off to such a fast start. Usually they're somewhat slow to get rolling. And Johnson – taking a page from the Dale Earnhardt playbook perhaps – is adding a little mouth to his game. Not really trash-talking; that's not Johnson's style. But just a bite or two. Jeff Burton, whose car owner Richard Childress has all three teams in the top-12, a good sign for the rest of the season, says everyone in the sport is once again forced to focus on Johnson. "When you win four championships and three of the first fives races, and you're not in somebody's head, then nobody's paying attention," Burton says. "If you're not paying attention to what they're doing -- and understand they're the guys you need to beat if you want to win a championship -- then you're not a fast learner. "You can be in denial about where they are (third in the standings, just 14 out of the lead, and all-but certain to take the top spot Sunday), and what they're doing if you like...but if you want to understand what you're up against, then you need to understand it. "They certainly have had the success that no one else has had over the past four years...and that no one has had this year. "If they're in people's head, they're in it because of their success, not because of what they're saying." So why aren't fans booing Johnson? Typically stock car fans start rooting against dominating drivers....but not Johnson. Tony Stewart says it's simple: "It's because he doesn't do anything on the race track that makes them mad -- other than win. "He's the kind of guy that it's hard to not like. "I get along with him great. "Every time I won a race last year, he was one of the first people to send me a text message congratulating me. 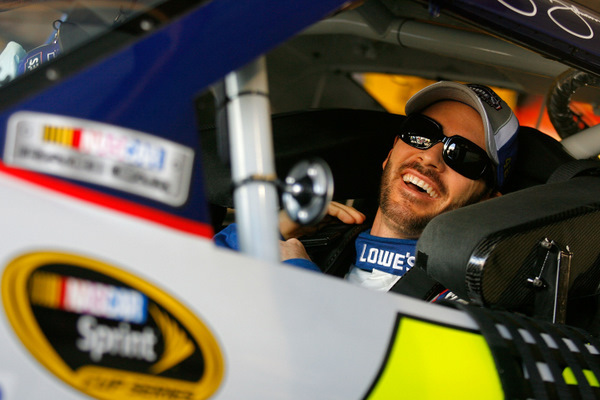 "That shows Jimmie's personality and character. "He's just not one of those guys who goes out there and gets into guys and gets into the trouble that creates that animosity fans have sometimes." Burton has won at Martinsville Speedway, but that's ancient history, 1997. The last few years haven't been so kind to the guy whose hometown is just 60 miles east. In fact Burton is still looking for his first tour win since the fall of 2008. He's had his chances this season; crew chief Todd Berrier has filled Scott Miller's shoes admirably (Miller, now sporting a collegiate goatee, is the company's competition director). But Burton hasn't yet delivered: "I'm disappointed we haven't executed with some opportunities we've had. We've run well and had fast cars at every race -- and I don't have the finishes to show for it (11th, third, 11th, 20th, 10th). "We had a great chance to win at California, and we didn't execute. People said 'Well, Jimmie got a lucky break.' He did -- but we restarted third, with enough laps to go to win the race...and we didn't make it happen. "Last week (at Bristol) we were running fifth on the last caution (the final restart was with 10 to go) and ended up finishing 10th. "At Atlanta we had fast car and had a problem...and then I made the problem worse. "We've got to do a better job of executing. If we do that, we'll win our races. "I don't want to say we're good enough to be winning, because if we were, we would have been winning," Burton went on. "You are what your record says you are -- and our record says we haven't been good enough to win yet. "But my focus has been on why haven't we been winning? "We haven't been winning because we haven't executed....and in some cases we weren't fast enough to win. "We need to get a little more speed, and we have to execute better." So the new flat-blade rear spoiler, Burton says, could be a plus for his team. Not here, because this track is too slow for aerodynamics to be a major issue, but at Texas certainly, and likely at Phoenix too, and then Richmond. Nobody knows quite what to expect at Talladega. (Though Dale Earnhardt Jr. does: "We'll start the race, run a little bit, everybody will find some position they are happy with, and we will all probably go to the top and ride around for about 300 miles...and then start racing. Riding around the top is fun. Probably super-boring for you guys, but a way to pass the time until the real race starts." Johnson says the new flat-blade spoiler will likely create more accidents: "I think it might create more spins and more wrecks. "With the old car there's no way (to save it)...and we're going back to that set-up. "So there's a chance there will be more cautions, because you don't have the end-plate on the wing to catch you when you get really crossed up. "But Texas will be the weekend when we find out what's up." This past week's two-day test at Charlotte didn't really show a lot, at least not that the teams are willing to explain. "Charlotte is a difficult track to test on," Burton says. "Since they've changed the track, the tires are really kind of odd: you go out the second time (after a heat cycle on the tires), and you're faster. You go out the third time, and you're faster yet. "It's really hard to get a balance there to know where you are. You put on new tires to make a run, and you would have been better if you had just stayed on older tires. "So that means that Texas (the next high-speed NASCAR stop, April 18th) is kind of starting over." And no one is really anticipating the new spoiler to slow Johnson and Knaus. "I expect the Hendrick teams will do well, and I don't think it will slow Jimmie down," Burton said. "I'm much more concerned about how it affects us. I know we need it to make us better."